This super fun and super sweet retro inspired chocolate bouquet is arranged by our pro florists in a ceramic `50`s style` ice cream pot. 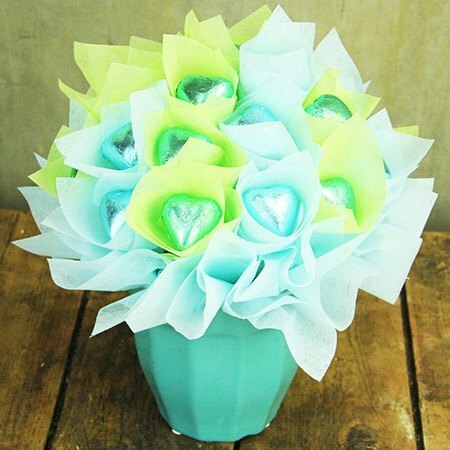 Using two dozen beautiful quality Beglian foil wrapped chocolate hearts in blue and green, this fabulous chocolate flower gift makes the perfect pressie for birthdays, celebrations and thank you`s. The beautiful quality product used by our florists in our chocolate flower boxes is made in Sydney using Callebaut chocolate - a Belgian couveture chocolate manufacturer that makes chocolate with a high cocoa butter content favoured by many gourmet and culinary professionals. In other words, YUM. Anyone with a sweet tooth will love this deliciously decadent gift! Want to add a little something extra to your chocolate bouquet? We recommend a bottle of bubbles, a fun balloon, soft cuddly toy or beautiful Ecoya candle from our range of gift add ons.